TCAPS' writing curriculum is based on Calkins' Units of Study. Each school has both K-2 and 3-5 units. This course is available for credit through CMU or SBE-CEUs through TBAISD. You can also participate in the course without enrolling for credit. videotape and upload short segments from your own classroom. Throughout this course you will both explore and implement your Writers' Workshop and develop your own personal narrative using the process outlined in Units of Study. Your personal narrative can be one to actually use with students, but does not need to be. For example, the one I wrote was for the adult audience with whom I was working; I would not use this one with students. The course will start with a very general overview of Writers' Workshop, and proceed to writing your own personal narrative interspersed with more detailed looks at each component of the workshop. This course will not cover every unit of the materials, but rather is intended as a starting point to implementing the units. strategies are disposable - can use any of them to get to a skill ex. to become skillful at writing effective introductions, can use the strategies of beginning with dialogue, setting, action, quote etc. ex. song, narrative, memoir, recipe, poetry etc. and not too far away! Celebrations of student writing happen at the end of each unit. Each Unit of Study gives suggestions of how to format celebrations so they are not always the same. For a list of Resource Materials, see Resources for Teaching Writing Grades 3-5 DVD (purchased for your builidng) under Launching the Writing Workshop. As you continue to implement Writers' Workshop and Units of Study in your classroom, you will now spend some time experiencing the workshop from the viewpoint of a student. You will be going through the process of creating a personal narrative. This narrative may be used in your classroom as a model, but does not need to be. In order to begin, click on the link below and complete the assignment. Now that you have listed times in your life when writing mattered, complete the assignment below. What trend do you see in your list? Complete the "Trends" activity on the link at the bottom of this box. What does this tell us about the writing we should ask kids to do? Have you been writing in your journal on a regular basis? For me it was a very difficult habit to establish. However, I noticed I began to identify so many everyday instances that could, even should, become pieces of writing in my notebook. Your previous assignments have not been completed in your notebook. Notebooks are a tool to 'hold' stuff - a collection of entries that perhaps one day may turn into published pieces. Notebooks are a "place to think." Drafts will not be completed in notebooks - drafts are completely separate documents that need to be kept in a writing folder. lists of interesting words, phrases etc. one that has the makings of a great story. Next, make a timeline of events connected to your choice. Always start with "The time I..." so thoughts are written in complete sentences. You may want students to write timelines vertically so they can use the lines of the paper. Finally, choose ONE piece of your timeline to expand on through writing. This will be the piece you carry out for the remainder of the course. A variation of a timeline is a Story Mountain. 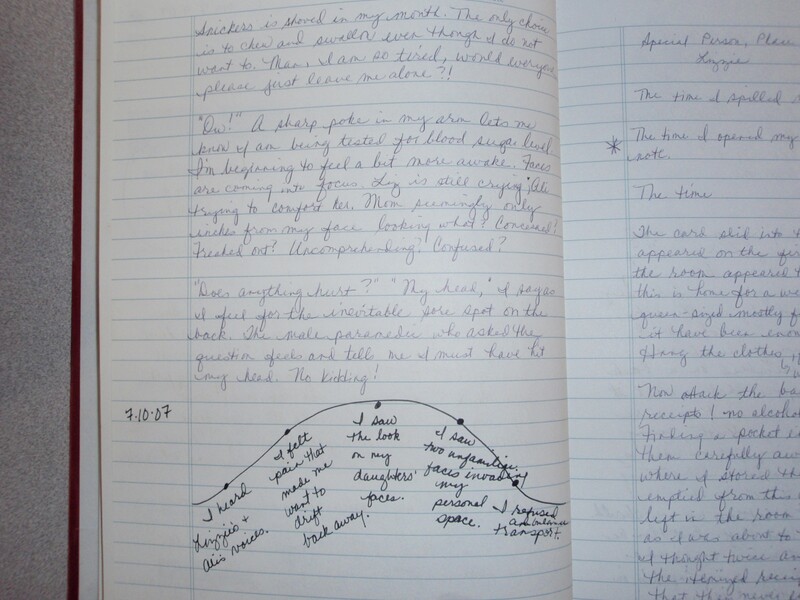 A Story Mountain may help a student to determine the "heart" of his story - that which he wants the reader to take away. To create a Story Mountain, ask yourself, "What do I want my readers to know?" Write approximately 7 sentences for this. This becomes the middle dot on your story mountain. This is the "heart" of your narrative. After you have determined the heart, work out from there. As I indicated in Module 10, I did not end up choosing any of the seed ideas listed there for my narrative. Instead, I decided to write about the time I broke my leg as I had been intending to write about it. I had actually even started, but never finished. Click here to see photos of the seed entry that started me on my narrative and the Story Mountain that came from that narrative. Then click here to see the actual script taken directly from my notebook. Students need to be taught how to write interesting leads. However, these are not written immediately. Several leads are "tried" after choosing and beginning to develop the seed idea. The following strategies can be used to develop leads. dialogue: "Mom, Mom! Get up! Mom!" Lizzie yelled. action: I walked into the tiny fitting room by myself. It was odd to be in there on my own with the girls each in their own as well. setting: A huge outlet mall and all the time in the world! What to do first? After choosing an entry to draft, students probably won't use all of the writing exactly as it appears in the notebook; they probably will use one of the leads they wrote. Drafts should be written ALL in one day. It is fast writing knowing there will be plenty of time for revision. On drafting day, tell students, "Today is the day we are going to write literature." Use the following strategy to help those who need it (and only those!). This strategy will prevent students from writing a whole story in a half page. It will help to organize their writing adding length and detail. Beginning in 3rd grade - fold paper in half. First half refers to first dot on timeline or story mountain: beginning - going toward top of mountain. Open paper. Top half of paper refers to 2nd dot, bottom half 3rd dot, fold paper again and writing for 4th dot goes on that half. Each event on a timeline ends up as a paragraph. Here is my first draft. To revise is to "go back and look again" to see your writing in a different way. To improve your draft, find the heart of your story - what is it you want your readers to know? Find that spot and s-l-o-w it down using another sheet of paper, perhaps a different color. Cut apart your draft to add the revisions; if you are only adding a sentence or part of a sentence, use a "spider leg" off to the side. This makes revised parts easy to see and the legs can be folded in in order to fit in students' folders. See "Draft Revision with Spider Legs" below. What else is it you would like to revise in your writing? Choose no more than 3 strategies and name them at the top of your revised piece that will be turned in for a later module. have a balance of internal vs. external (in K-2 it is referred to as show vs. tell). I want to share some management information from Lucy Calkins' presentations during the 2007 Teachers College Writing Institute. In May or June - plan a half day with all teachers for the upcoming year (could do this at any point of the year prior to starting the units). It is essential to stick to the curricular calendar you mapped out so you stay on track and teachers can reflect together when they meet. One unit of study should take one month - 20 days. See the links below for a map of writing across the year. Lucy Calkins believes we are doing a disservice to our students if we dwell on a unit longer than this. The strategies presented in mini-lessons are not "assignments," rather they are strategies that students are expected to use always. The first two units are always narrative - this is NON-NEGOTIABLE; after this you can move to informational or expository reading (my suggestion: follow the units as Lucy Calkins has them set up your first time through). At the beginning of each unit, decide the minimum number of entries students will produce. Calkins suggests: K produce 15, 1st 10, 2nd 6 or 7. Older grades will have fewer than this as they are spending more time revising. Do NOT expect students to write ONLY one entry each day - they should be writing several. Spend ONLY 20 days per unit. The first piece to teach in any unit is the strategy for generating the particular type of writing in that unit. My dad is special to me because he taught me to ride my bike. My dad is special to me because he makes me laugh. My dad is special to me because he taught me to be my own person. *This only takes 3-5 minutes (students would be writing these in their notebooks as you are gathered in whole group). On the FIRST day of class, have students write a narrative in 45 minutes (can adjust the length, but should still be a good chunk of time.) Score this piece on the rubric you will be using throughout the year. Find the appropriate rubric in the "green book." Do this same formative assessment 2 months later to gauge progress. Also score published work; published work should only be 1-2 levels above independent work (an analogy would be the difference between guided and independent reading levels). DAY 1-2: Generate entries in writer's notebook - students CHOOSE what to write about!! DAY 3: Teach how to write well in this particular unit. ex. first qualities of writing that are easy and have big payoff: focus (going from watermelon story to seed idea) and detail. Need to teach the difference between summary and storytelling -this is complicated. Teach students to write a story across only 20 minutes of time. This avoids the "bed to bed" and "Fiddler on the Roof" (sunrise/sunset) stories. DAY 4: Have students choose one seed idea from their collection of entries - note: all students are writing on topic of choice as they chose from their own entries. DAY 5: Help students rehearse the strategies you are focusing on in that unit such as timelines, leads, internal vs. external etc. Students "try out" these strategies in their notebooks. DAY 6: Spend ONE WHOLE day to draft. Remember drafts should be written ALL in one day. It is fast writing knowing there will be plenty of time for revision. This helps writing to be more cohesive. It also prepares students for standardized testing situations when they have to compose a piece in a certain amount of time. Drafts are written outside the notebook on lined paper. DAY 7: Begin revision - students need to determine the "heart" of their story and stretch it out. You may need to "interrogate" students to help them figure out what they really want readers to know and bring out details. For example if a student wrote, We celebrated my sister's birthday. You can ask: what is your sister's name? Include that! How old is your sister now? Include that! etc. Teach students that if they don't remember every detail, make it up! Your readers will not know. Also teach students to balance both the internal and external story - use words such as "I wonder," "I remember," "I noticed" etc. Students tend to remember (or want to make up) dialogue so they tend to include too much. Help them to create a balance. AFTER THESE 7 DAYS, complete the entire process again with another seed idea students choose from their notebooks. THEN, have students choose ONE of these pieces to take to publication to be used for Celebration! FOR FINAL PUBLICATION: teach each student ONE point (what is MOST important for that writer at that time?) to carry in to his final draft. TEACHER corrects all other errors! You can say, "Pay attention to the parts I help you with and make sure you do it that way." (Of course, students will not catch everything you are doing, but you are holding them accountable as you edit.) Remember: published pieces need to be perfect, but students can only learn one thing at a time. The teacher then, as the more capable other, edits to perfection! Students need to write LOTS in order to become proficient writers - just as basketball players need to shoot LOTS of free throws in order to become proficient. if students are writing a lot, they are not doing "other things". So, how do you encourage volume? Try the strategies listed below. Cheerlead volume in the beginning of the year. Place check in margin and say, 'nice job, you've written a half a page'. Doesn't matter right now if writing isn't good, the focus is on volume. Could stop writers and ask to count lines written and then encourage them to set a goal for the rest of the period. After a week and a half, look back to see if entries are getting longer. Tell students to think of a whole sentence and write it without stopping in order to increase speed of writing. Do not allow students to write word by word just as we don't want them to read word by word. Make a plan with class; say, 'it looks as though we can all say we will all write at least a page a day'. Have consequences if students don't meet goal for the day (wouldn't accept that it is ok to not complete math). Can say, 'you didn't get a whole page today? That's ok, you can finish during recess/free time etc.'. Differentiate by allowing struggling writers to skip lines (although Calkins does not believe skipping lines is a good idea - get rid of this as soon as possible). Do not have to push volume all year - once they are used to producing, they may spend lots of time on any day revising. Remind students what they have already been learning either recently or in past months so they continue to use it - be specific! Do some things wrong so you can show how to fix that. "Tuck' tips in along the way. Finally, re-cap the steps using the language, "Today and for the rest of your lives, remember you can..."
Most often use familiar text as opposed to having students open notebooks and find one. Use an example from your entries that matches your teaching point, BUT take those pieces out to demonstrate how it looks at the beginning. Your entry must be one your audience can relate to - ex. 11 and 12 year olds cannot relate to a disagreement with a spouse, but could relate to a time you felt left out. When writing for kids, write about times when you were their age and of what is important to them such as fitting in. Ask students to "write in the air" as opposed to "turn and talk." The first asks the students to dictate what they would write rather than discuss. Boost the children's writing energy. When traveling the room to conference, carry your writer's notebook, a mentor text and any other record-keeping materials you will use. ALL individual conferences should take place using the following format. Study what the writer is already doing - think of a doctor asking, 'how's it going?' and then asking what particular issues they are having. Ask the writer, 'How's it going for you?' 'What are you working on as a writer?' 'Give me an example.' Students need to be taught how to answer this question. Do not allow them to tell you what they are writing ABOUT, teach them to talk as a writer. MUST teach students to confer well - give them language to talk as a writer. **As a teacher, keep researching longer than your instinct tells you - don't jump to the first teaching point you find. Teacher reads student text silently (do not have to read all of it) - do not have student read text aloud. Ask student, "What are you planning next?" *MUST have compliment and teaching point in mind before ending research step. Very powerful - may be more powerful than teaching point! Be personal and genuine with the compliment. The compliment should be 5 or 6 sentences long, not just one. The compliment should elicit a smile! Ask, "Can I give ONE suggestion?" Asking permission from the writer prior to the teaching point establishes tone and builds a relationship that will open the child up to suggestions. Teach the point using either a demonstration, coaching, mentor text or inquiry. Prior to leaving, say, "Tell me what you are going to do today." After student has responded, say "Great, I'll be back to admire your work!" *Make use of small group/table conferences - the last 1/3 of any unit may not have made sense to 1/3 of the students so those will need table conferences/small group work. Research for one minute - glance at work to see if they are applying mini-lesson idea - all may not be as the mini-lesson is a strategy introduced that they may not necessarily use or need that day. Either find one student who is doing it OR work with one who should be. Say 'Writers, (make sure you have ALL eyes) I want to give you a tip' then repeat the language of the mini-lesson. 'Watch me as I work with Henry. Right now ask yourself that question." *Even if their next attempt is not perfect, leave it - it is their approximation for that time. Scan the room to see who needs the same strategy. Gather them at a table. Use same process as for a table conference. LC doesn't believe you have to get to every student 'even-handedly.' Just as in any subject, some students may need more support than others. When switching from narrative to informational or expository writing, remind students to remember everything they have learned about writing narrative. Encourage students to still use dialogue. Remind students they still need to include details. What would a new writer have to know? Attribute books: My Family - I love my dad. My dog is fat. Teach student to choose one topic and expand on it. Stay on topic - All About Book - Dad Works, Dad Cooks etc. Then categorize: Dad cooks breakfast. Dad cooks lunch. Then passages of thought - this develops a paragraph for each sub-topic. There needs to be a rhyme or reason to the order of the writing. Then writing about a subject you know. Now you are not only writing about information, but are digesting and musing about it. The pattern becomes info/ideas, info/ideas. Broader subjects are easier to write about, but small topics become more sophisticated. 2nd grade teachers could teach persuasive letters first (baby essays) such as we need more recess time etc. Essay means 'to wander' - it is true this is how essayists write, but Calkins believes students need to learn how to write academic essays. Writing to think, exploring topics in order to come up with provocative, original, smart ideas. 1) Think of a person, place, object or issue and list big ideas about it. 2) Choose one idea and 'write long' about it. 3) Observe and write what you see. Click here to read my writing generated through observation. 4) Fly in mind's eye. Click here to read my writing generated as I flew through my mind's eye. 5) Re-read an entry from narrative unit and write thoughts about it. This strategy yields the most. Click here to read one of my narrative entries that turned into an informational text. All of the ways listed above should be mini-lessons over consecutive days. This would be a (rare) time when you are asking all students to use the same strategy during writing time, but they still all choose their own topic. After 2 days, stop gathering. 2) Teach kids to grow a thought by writing - will find you can discover thoughts as your pen flies across the paper. Then, 'Who can get us started in a conversation?' (ex. I think Gill (or any character) is me.) What do the rest of you think? Do you agree? Help students to clean up their writing - check all writers so they don't go forward without a concise thought. Ex. My dad is important to me. vs. The aggressive nature of my dad's coaching has had a powerful impact on me. State a claim and then a reason (do this by adding "because".) Have students restate the claim each time so they stay on track and think and speak in complete sentences. Allow students to write with repetition at this stage as they are learning the process. ex. "My dad loves me" AND "My dad cares for me" are too similar. ex. 'Teachers need patience, wisdom and paper clips,' doesn't work. My life has too much order because I feel the need to stay on track. My life has too much order because I am most comfortable this way. My life has too much order because I worry about getting everything done. My life has too much order because I worry about doing things right. See "Box and Bullets" in the body of this block for a picture of what mine looked like. *Have students repeat the claim each time. It is stilted at first, but in the end, they will combine these to make one thesis statement. Ex. My life has too much order because I feel the need to stay on track, I am most comfortable this way, I worry about getting things done and doing things right. For each bullet, collect stories or lists to support the reason. Each bullet becomes a folder - each folder then becomes a paragraph. See "Box and bullets with one folder open" to see how to collect stories for each bullet. Spend 3 or 4 days (total) to collect small stories/evidence/support for each bullet. I worry about a messy house. I worry about what I wear. After having collected stories, find only what is compelling and get rid of the rest! Essays are harder to generate than narrative writing. Writing essays at this level is the same as the task asked of secondary writers, but elementary students are using personal vignettes for support rather than support from literature. In this unit, struggling writers usually rise up and more capable writers fall back - the playing field evens out. All of the information above is not about persuasive writing, don't have kids be persuasive, but reflective. "I used to think.." ending with "Now I think..."
"Some people think..." ending with "But I believe..."
MINE: (formulated from Boxes and Bullets from Module 26) I used to think everything needs its own place, but now I realize some of the best things in life happen/matter from the unplanned. Show how you will now take a little action as you ponder your thesis. Have writers try several introductions and conclusions in one day. My father is my best teacher because he taught me to write and to fail, but the most important thing he taught me was to be myself. All of these are important! Students need to be taught to become competent at it. The world judges people by poor spelling. Students need to be resourceful - words they know can help them know how to spell other words. Expect students to spell word wall words correctly - this is NOT a COPYING act; students need to learn it. On writing drafts say, "Oh my goodness, your word wall words are not spelled correctly. Go and fix that." You have neither identified the misspelled words nor told them how to spell correctly. DEMAND students absolutely have control of punctuation in 3rd grade. Students need to punctuate in ALL writing even if it is not totally correct, they need to be paying attention to it. By 5th grade, students should spell 90% of words correctly and resourceful enough to figure out the other 10%. Resources for All Year: "Word Wall Tips" and "High Frequency Word Wall Words for K and 1"
Writing for Readers: Teaching Skills and Strategies: "High Frequency Words"
Determine what is weird about it. See it in your head. As final publications are for public consumption, they MUST be error free. However, students may not be ready to edit completely; therfore, teach each student ONE point to carry into final draft then teacher corrects ALL others. As students watch you on the computer, say, "Pay attention to the parts I am helping you with and make sure you do it that way next time." You do not need to point out each change you make; they will not master the corrections you make, rather it sends the message that they need to pay attention.